Granted, that leather sofa you’ve been eying would make an elegant addition to your living room. But think about your cat’s personality and scratching and litter-box habits before you buy. Some cats hate the smell and feeling of leather and stay as far from leather sofas as they can. But others treat it just the way they would any other furniture covering and use leather sofas for lounging and scratching. Leather for furniture comes in four grades. Bonded leather is made from scraps and is the least expensive and least durable furniture covering. Split grain leather comes from the underside of the animal’s hide and is stronger than bonded leather. Some manufacturers use it for the backs of sofas and chairs where it won’t show. Top grain is the outer layer of the animal’s hide and is the most durable. Full grain leather is also made from the outer layer of the animal’s hide but is not treated or processed. Because the leather is untreated, it can be difficult to maintain, according to a Beginnersguide.com article. One of the advantages of having a leather sofa with cats is that it’s easy to clean. Cat hair “practically slides right off,” says pet-friendly interior designer Colleen Paige on her website, Colleenpaige.com. Some cat damage to leather sofas can be repaired or hidden. Many resources are available online for repairing leather furniture. Some cats will spray any new piece of furniture to make it smell familiar. But “leather furniture seems to be especially vulnerable to being marked,” perhaps because the acids used to tan leather smell similar to uric acid, says Animal Ark executive director Mike Fry on his rescue group's website, Animalarkshelter.org. Another theory is that the leather may still smell like another animal, and some cats try to cover that animal’s scent with their own. Spraying a leather sofa with a product that mimics the “friendly” pheromones in a cat’s cheeks or rubbing the sofa with catnip can discourage urine marking. Although leather may seem indestructible, a cat’s thin, sharp claws can scratch, puncture and even tear it. Advanced Leather Solutions in Hayward, California, repairs more than 10,000 cat scratches a year, according to the company’s website. Full grain leather is most susceptible to cat damage because it’s so supple. The website Leather Furniture Guide.com warns that cat claws can tear all the way through and even shred full grain leather. Prevention may be the best protection for your leather sofa. 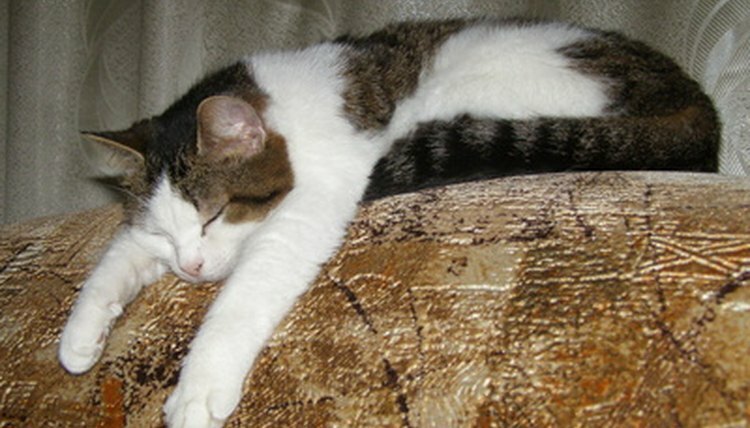 Writing for Petconnection.com, syndicated columnist and author Gina Spadafori suggests training your cat to stay away from the old couch before the new one arrives. Her recommendation: Cover the places the cat likes to scratch with shelf paper, sticky side up. The cat won’t like the sticky feeling on its paws and will learn to stay off the couch. Another way to keep cats off a leather sofa is to use an electronic deterrent that creates a tingling sensation when stepped on. Most pet supply stores sell electronic cat deterrents. Keeping the cat’s nail trimmed; putting a tall, stable scratching post against the sofa; and using a soft throw to create a “safe” place where the cat can walk and nap on the couch will also protect a leather sofa from your cat. Beginners Guide: Are there Different Grades of Leather Furniture?